An instrument with expanding percussive wings co-created with world-renowned designer Michael Curry. These drums emit mystical smoke rings over the audience in sync with music from the band. The stage is bigger, the lights shine brighter and the music jams harder at our specially designed Blue Man Theatre at Luxor Hotel and Casino on the Las Vegas Strip. take a selfie. The Blue Men love a good selfie. Top it all off with a Very Important Drink and Souvenir. We know all VIPs like exclusives so you can also go behind the velvet rope with our exclusive 75 minute behind-the-scenes tour prior to the first performance of the night. Guests get an inside perspective of what it takes to put on an award-winning Las Vegas production, a backstage journey through the colorful world of Blue Man Group with a tour of the show’s wildly inventive instruments and props and exclusive access and viewing of our nightly sound check with the cast and crew from that evening’s performance. Book your VIP or Behind the Blue Experiences now or call 702.262.4400 to learn more and book. whether you’re coming with the family, have an AAA or AARP card or are a member of the military. Learn more and buy now. 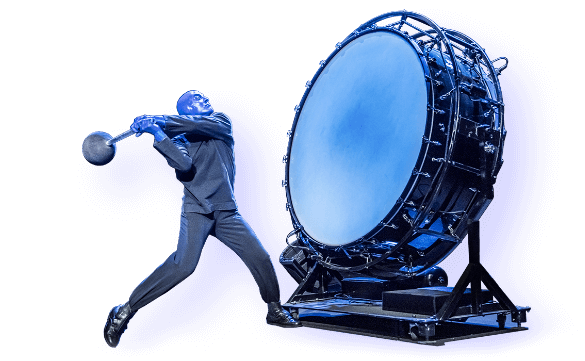 Blue Man Group is a family-friendly performance appropriate for children and adults. Children under three (3) may be admitted into the performance at the discretion of management at no charge and are required to sit on the lap of an adult. Luxor Hotel and Casino hosts many restaurants, conveniently located near the Blue Man Theater. 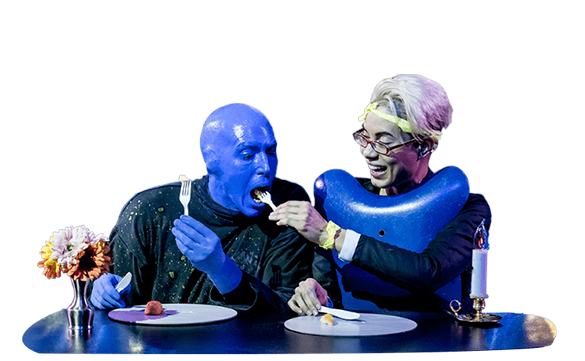 Dinner and show packages are available through the Blue Man Group Box Office or by calling 800-258-3626. Yes, strobe lights are used during portions of the show. If you are sensitive to strobe lights, please alert the Theatre House Manager when you arrive. Upon request, a staff member will help you leave the theatre before strobe lights occur. Groups receive exclusive discount rates at many performances, avoid online service fees, and can get priority booking before dates are on-sale to the general public. We offer flexible payment policies, allowing you to hold reservations and modify them until a few weeks prior to the performance. Plus, our dedicated Group Sales team in each city will guide any questions you may have along the way, and make your experience quick, easy and fun. Learn more at groups.blueman.com and contact Group Sales at 1-702-697-1655 or by email at groupsales@blueman.com to begin. If you plan to attend the Behind-the-Blue Experience tour at Blue Man Group Las Vegas you must wear closed-toe shoes (no sandals). The specially designed Blue Man Theater at Luxor offers the intimacy of our Off-Broadway show in New York, but with all the spectacle of Las Vegas. 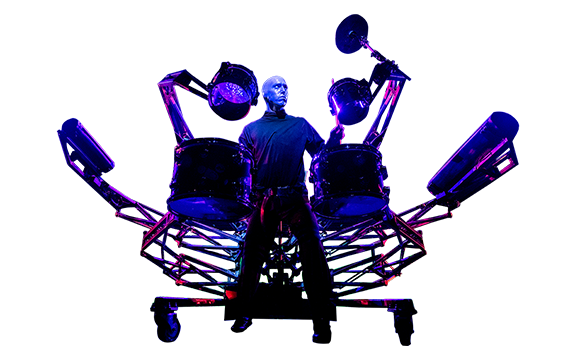 Blue Man Vegas also features exclusive performance content created specifically for the Las Vegas production that cannot be seen in any other Blue Man show. Backpacks are not allowed into the Blue Man Theater at Luxor Hotel and Casino. They can be checked prior to the show at Luxor’s bell desk on the ground floor. Luxor Hotel and Casino offers paid valet services and paid self parking. Paid valet services are available at both the north entrance from Reno Ave. and the east entrance from Las Vegas Blvd. Paid self parking is available on the west side of the pyramid. View the map. The theater is located on the Mezzanine level of the Luxor Hotel and Casino. For tour venue addresses, please click here and select your city. Disclaimer Must purchase tickets with a valid Mastercard. Additional fees may apply. Subject to availability and modifications. Cannot be combined with any other offer or on previously purchased tickets. All sales final. Blue Man Group reserves all rights.